ABSTRACT. Marine migratory species encounter a range of threats as they move through coastal and oceanic zones. Understanding the connectivity and dispersal patterns of such species is critical to their effective conservation. Here we analyzed the temporal genetic composition and the most likely origin of juvenile green turtles foraging at Puerto Manglar and Tortuga Bay, Culebra, Puerto Rico, using mitochondrial DNA control region sequences. We identified 17 haplotypes, of which CM-A3 (51.5%), CM-A5 (19.4%) and CM-A1 (13.6%) were the most common. Haplotype (h) and nucleotide (π) diversities were 0.680 and 0.008, respectively. There was no evidence of significant variation in the genetic composition of these aggregations throughout seven years (2000-2006), suggesting that relative contributions from source populations did not significantly change during this period. 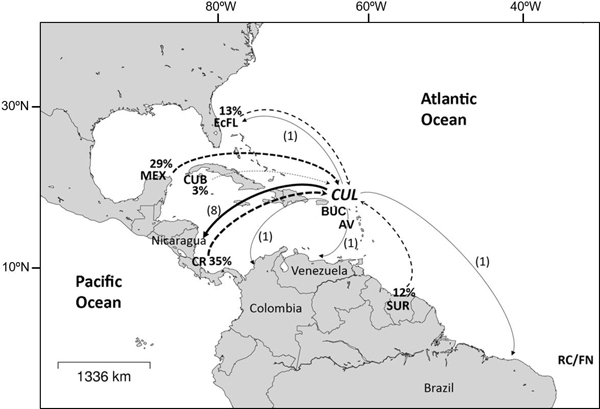 Mixed Stock Analysis (MSA), incorporating 14 Atlantic nesting populations as possible sources, indicated four main contributing stocks to the Culebra foraging grounds: Costa Rica (34.9%), Mexico (29.2%), East Central Florida (13.2%), and Suriname (12.0%). The regional pattern of connectivity among Wider Caribbean rookeries and Culebra was further evidenced by a second MSA using Atlantic Regional Management Units (RMUs) as sources, with 94.1% of the mixed stock attributed to this area. This study addresses the information gap on the connectivity of the green turtle in the North Atlantic, and establishes an important baseline that can be used to determine future changes in stock composition. Keywords: Chelonia mydas, connectivity, mixed stock analysis, mtDNA, foraging ground. Anthropogenic activities in the world's oceans are leading to a rapid decline of species and marine ecosystems health (Halpern et al., 2008). Marine migratory animals, such as whales (Rasmussen et al., 2007), sharks (Bonfil et al., 2005), seabirds (Catry et al., 2011), and sea turtles (Hays & Scott, 2013), are among the most vulnerable due to the range of threats they encounter during their extensive movements (Lascelles et al., 2014). Understanding the temporal and spatial distribution of these species and the connectivity between geographic areas is therefore essential for an integrated management and the conservation of marine ecosystems. Sea turtles carry out some of the greatest migrations across ocean basins (Hays & Scott, 2013), going through habitat changes during their lifecycle (Heppell et al., 2002; Bowen & Karl, 2007). The green turtle Chelonia mydas immediately after hatching at the beach, reaches the ocean and begins an oceanic period coupled with pelagic habitat and epipelagic feeding (Heppel et al., 2002), which may last 3-5 years in the Greater Caribbean (Reich et al., 2007). During this phase, known as the 'lost years', the distribution and movements of the turtles are poorly known, but they seem to be shaped by a balance between association with oceanic currents (Lahanas et al., 1998; Putman & Naro-Maciel et al., 2013) and directed swimming (Putman & Mansfield, 2015). 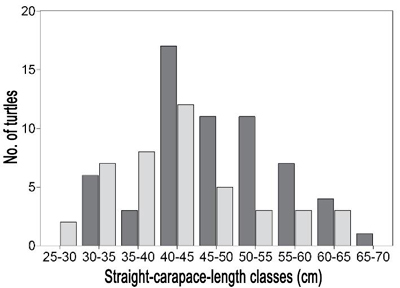 At 25-35 cm straight-carapace-length (SCL), juveniles recruit to shallow neritic areas and shift to benthic feeding (Heppell et al., 2002; Bolten, 2003). Neritic zones are used as developmental habitats, where turtles spend several years foraging until reaching a size or maturity stage that triggers them to migrate (Bjorndal et al., 2005a). Sexually mature individuals move periodically from foraging grounds to nesting beaches and mating areas, often separated by hundreds to thousands of kilometres (Bowen et al., 1992; Bowen & Karl, 2007). The composition of sea turtles at both the nesting beaches and foraging grounds has been assessed with genetic markers. The maternally inherited mitochondrial DNA (mtDNA) has been most widely used (Bowen & Karl, 2007; Lee, 2008; Jensen et al., 2013), revealing that near-shore aggregations of immature green turtles are mixed stocks composed by individuals from multiple nesting colonies, whereas nesting beaches form largely isolated populations (Bowen & Karl, 2007). This structure among rookeries results from the natal philopatry exhibited by marine turtles, in which the reproductive females return to the beaches where they hatched to nest (Meylan et al., 1990), and it enables estimating the sources of turtles sampled at foraging grounds, through the use of Bayesian mixed stock analysis (MSA; Pella & Masuda, 2001). MSA iteratively compares the distribution of haplotype frequencies between a foraging ground and each putative rookery of origin, and may incorporate ecological information such as rookery size, improving model estimates. In the Greater Caribbean region, unsustainable harvesting of marine turtles during and prior to the 20th century led to the decline of several rookeries. Some of these nesting populations have been recovering over the past decades, following protection from human hazards (e.g., Tortuguero in Costa Rica, Archie Carr Refuge in Florida, Aves Island in Venezuela, Chaloupka et al., 2008, Garcia-Cruz et al., 2015), which consequently should be reflected in the recruitment to juvenile aggregations. MSAs have looked into the origin of foraging grounds in Florida (East Central Florida, Hutchinson Island, St. Joseph Bay and Dry Tortugas and Everglade), Texas, the Bahamas, Barbados, and Nicaragua (Bass & Witzell, 2000; Foley et al., 2007; Naro-Maciel et al., 2012; Proietti et al., 2012; Prosdocimi et al., 2012; Anderson et al., 2013; Naro-Maciel et al., 2016). Developmental foraging habitats are further known from several other areas (e.g., Belize, Bonaire, British and American Virgin Islands, Puerto Rico, St Kitts and Nevis), but they remain genetically uncharacterized. Of additional importance is the understanding of the temporal variation on genetic composition of mixed stocks. 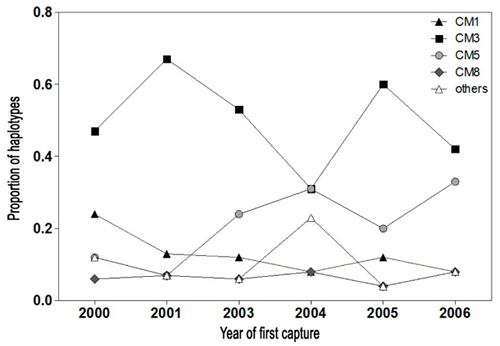 In the Bahamas, variability in the frequency of mtDNA haplotypes of a green turtle juvenile aggregation was detected over a 12-year period and attributed to increased recruitment (Bjorndal & Bolten, 2008). Temporal variability in source contributions has been attributed to very low hatching success at a major source elsewhere (Jensen et al., 2016). Other studies with green turtles in Brazil (Naro-Maciel et al., 2007) and Florida (Naro-Maciel et al., 2016), and with hawksbill turtles in Puerto Rico (Velez-Zuazo et al., 2008), however, found no temporal variation on the genetic composition of juvenile aggregations. In Puerto Rico, Puerto Manglar and Tortuga Bay at Culebra, are recognized as important developmental habitats for juvenile green turtles (Diez et al., 2010; Patrício et al., 2011, 2014). Turtles as small as 23 cm SCL are known to recruit into these coastal bays, where they spend over a decade, departing before the onset of sexual maturity (Patrício et al., 2011, 2014). Here we investigate the genetic composition of these foraging aggregations during a period of seven years and estimate the most likely origins of these stocks using a MSA, including 14 Atlantic nesting populations as potential sources. This study addresses the information gap on juvenile foraging ground composition in the Caribbean and sets a baseline for the Puerto Rico aggregations, allowing comparisons with future monitoring. Puerto Manglar (18.30°N, 65.25°W) and Tortuga Bay (18.32°N, 65.23°W) are two foraging grounds for immature green turtles, located at Culebra and Culebrita Islands, respectively, within the boundaries of a critical habitat for the green turtle, designated by the Endangered Species Act (NMFS-NOAA, 1998) in Puerto Rico (see Fig. 1 in Patrício et al., 2011). The Department of Natural and Environmental Resources of Puerto Rico (DNER-PR) has conducted a capture-mark-recapture program at these sites, since 1997. From 2000 to 2006 we collected samples from 103 green turtles foraging in these bays [2000 (18), 2001 (16), 2002 (2), 2003 (17), 2004 (13), 2005 (25), 2006 (12)]. Turtles were captured with an entanglement net (200 m long, 5 m deep, nylon twine, 25 cm stretch mesh size) deployed for ~1 h sets at <5 m depth, with the help of a motor boat. Swimmers snorkelled continually along the net to locate and disentangle trapped turtles. Turtles were kept in the shade and covered with wet towels while captive and until processing. Handling time averaged 15 min per individual, after which turtles were released close to their capture location. Tissue samples were collected from the shoulder area using a disposable biopsy punch (4-6 mm diameter, Acuderm®). Samples were preserved in 95% ethanol or salt-saturated 20% DMSO-20% EDTA and stored at room temperature. SCL of sampled individuals was measured with Haglof tree calipers to the nearest 0.1 cm. All turtles were applied a unique ID tag in both front flippers to avoid misidentification and sample duplication. SEC: South Equatorial Current, BrC: Brazil Current, GC: Guinea Current, BgC: Benguela Current. DNA was extracted using the DNeasy Blood & Tissue kit (Qiagen) following manufacturer's instructions, and eluted in a final volume of 50 μL per sample. DNA concentrations were quantified with a spectrophotometer (NanoDrop® ND-3300) and a 735 bp fragment of the mtDNA control region was amplified by Polymerase Chain Reaction (PCR) with primers LTEi9 and H950 (Abreu-Grobois et al., 2006). Amplifications were performed in a total volume of 10 μL, with 1 μL genomic DNA at a concentration of ~10 ng μL-1, 4.0 μL of Qiagen Taq Master Mix, 0.5 μM of each primer at 10 μM and 2.0 μL MilliQ water. PCR started with an initial denaturing step of 5 min at 94°C, followed by 30 cycles of 30 s at 94°C, 30 s at 52°C, and 1 min at 72°C, with a final hold at 72°C for 5 min. All PCR reactions included positive and negative controls. PCR products were purified with ExoSAP-IT (Affymetrix) and sequenced in both forward and reverse directions using a BigDye Terminator v.3.1 (Bioanalytical Instruments) and the automated sequencer station ABI 3130xl (Applied Biosystems) at the Sequencing and Genotyping Facility of the University of Puerto Rico, Rio Piedras. Sequences were assembled and aligned by eye using Sequencher 4.5 (Gene Codes). To identify unique haplotypes and estimate absolute haplotype frequencies we used DNAspv4.10 (Rozas et al., 2003). Haplotypes were identified using the Basic Local Alignment Search Tool (BLAST) from the National Center for Biotechnology Information (http://www.ncbi.nlm.nih.gov/) and named following the standardized nomenclature of the Archie Carr Center for Sea Turtle Research. Haplotype (h) and nucleotide diversities (π), pairwise genetic distances among groups (FST), and exact tests of differentiations (Raymond & Rousset, 1995) were estimated using Arlequinv 3.1 (Excoffier & Lischer, 2010) for two sets of groups: 1) sample years at our study sites (n = 6), and 2) Atlantic green turtle foraging grounds (n = 18, Fig. 1). A false discovery rate (FDR) correction, following Narum (2006), was applied to calculate the most fitting threshold for the P-value significance, considering the number of comparisons involved in the analysis, under an expected original threshold of P < 0.05. The sample size for 2002 was too small (i.e., n = 2) for robust statistic comparisons among years, so it was excluded from the temporal analysis. We truncated the DNA fragments to 491 bp length, the fragment historically explored and for which most genetic information is currently available, to compare diversity estimates with other foraging aggregations. To investigate how mithocondrial control region diversity is partitioned among foraging aggregations, we conducted a spatial analysis of molecular variance (SAMOVA, Dupanloup et al., 2002), incorporating geographic positions obtained through Google Earth, and using 100 simulated annealing processes. This analysis defines geographic groups that are maximally differentiated (rather than defining a priori groupings). 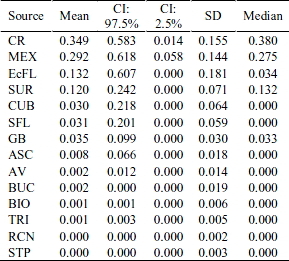 The FCT statistic from AMOVA (calculated a posteriori) was then compared among different values of groups (K), ranging from 2 to 18 foraging grounds, to assess the most likely number of K, corresponding to the highest FCT (Dupanloup et al., 2002). Additionally, genetic distances between foraging sites were included in a principal coordinate analysis (PCoA) using the package Genalex 6.5.0.1 (Peakall & Smouse, 2012), to plot variability in a two-dimensional space. The most likely origin of the studied aggregations was estimated through a "one-to-many" MSA using BAYES (Pella & Masuda, 2001). We compiled the available genetic information from green turtle Atlantic nesting populations and used it as baseline information for the MSA (See Fig. 1 for sites included in this study, site abbreviations, and literature sources, and Table 1 for genetic composition). Rookery size, defined as the number of nesting females per rookery (Seminoff et al., 2015), was used to establish weighted priors. Previous studies have shown that there is significant structure among most of the genetically characterized Atlantic green turtle rookeries (Bolker et al., 2007, Shamblin et al., 2012, 2014), supporting the applicability of a MSA. There is however a lack of genetic differentiation at the mtDNA control region between some individual rookeries (e.g., Suriname and Aves Island, Naro-Maciel et al., 2016), so we also ran a MSA pooling the individual rookeries into Regional Management Units (RMUs, Wallace et al., 2010), which group multiple nesting populations based on their genetic similarities, for conservation management. Following Naro-Maciel et al. (2016), the RMUs were defined as: 1) Northwest Atlantic - EcFL, SFL, MEX, CUB, CR; 2) Central Atlantic - BUC, AV, SUR; and 3) South and East Atlantic - RC/FN, ASC, TRI, GB, BIO, STP. Four independent chains with different starting points were run for 30,000 iterations, with a burn-in of 15,000 steps. We used the Gelman-Rubin diagnostic to assess convergence of the chains to the posterior distribution, assuming that there was no evidence of non-convergence at values <1.2 (Pella & Masuda, 2001). number of nesting females at rookeries. See Fig. 1 for site abbreviations. At Puerto Manglar (n = 60) mean SCL was 47.4 ± 8.8 cm (mean ± SD, range: 32-70.9 cm, Fig. 2), and at Tortuga Bay (n = 43) it was 44.7 ± 11.0 cm (mean ± SD, range: 28.4-69.8 cm, Fig. 2). There was no significant difference in SCL distribution between the two groups (t101= 1.3832, P = 0.1696). Tortuga Bay (n = 43, light gray) foraging grounds, Puerto Rico. We detected 17 polymorphic sites at the 735 bp mtDNA fragment, one transversion, 16 transitions and one insertion (position 617), defining 17 haplotypes, 13 of them previously described (Supplemental Table 1). After truncating the sequences the total number of haplotypes dropped to 10 (Table 1). In both aggregations the haplotype CM-A3 was dominant (PM: 43%; TB: 63%), followed by haplotypes CM-A5 (PM: 22%; TB: 16%), CM-A1 (PM: 15%; TB: 12%), and CM-A8 (PM: 7%; TB: 5%). 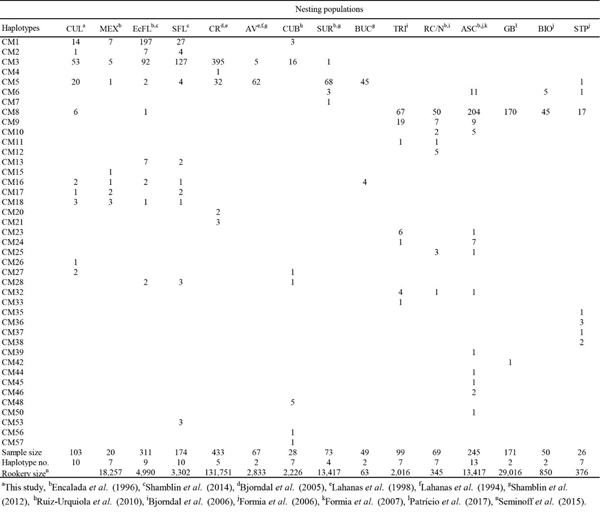 We also identified rare haplotypes with frequencies of 1-3%: CM-A2, CM-A16, CM-A17, CM-A18, CM-A27 and an orphan haplotype, CM-A26, not yet reported in a nesting population, emphasizing that some stocks still lack genetic studies or have not yet been adequately sampled. A randomized Chi-square (χ2 = 6.05, P = 0.89) and an exact test of differentiation (P = 0.88) indicated no significant genetic structure between the two aggregations, so these were pooled for further analyses, referred to henceforth as the Culebra foraging ground. We found no significant temporal variation in the haplotype composition of the Culebra foraging ground among sampling years over seven-year period (Table 2). 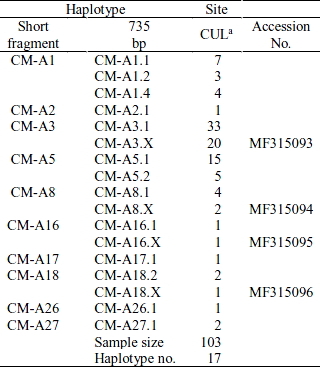 There seems to be an increase in haplotype CM-A5 with time, however (Supplemental Fig. 1). 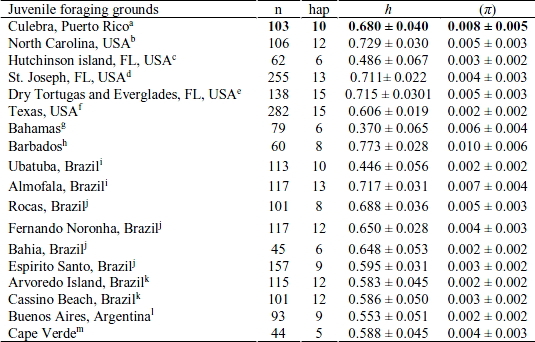 The haplotype (h) and nucleotide (π) diversities at Culebra foraging grounds were comparable to those of Atlantic green turtle aggregations (Table 3). Culebra was significantly different from all other foraging sites except the Bahamas (Table 4). the mitochondrial DNA as a marker. The study population is represented in bold. kProietti et al. (2012), lProsdocimi et al. (2012), mMonzón-Arguello et al. (2010). = 0.002, for a P < 0.015, FDR = 0.000; Narum, 2006). The SAMOVA suggested that the 18 foraging aggregations were partitioned into two or three main groups, with FCT = 0.7061 for K = 2, and FCT = 0.7074 for K = 3. The estimates of FCT decreased faster as K increased, after K = 3 (Supplemental Fig. 2). Because the percentage variation between populations within groups increased from 1.5% for K = 3 to 2.5% for K = 2 (Supplemental Fig. 2) by including Barbados with the south Atlantic foraging grounds, we consider that K = 3 is a better grouping. This was consistent with the PCoA. 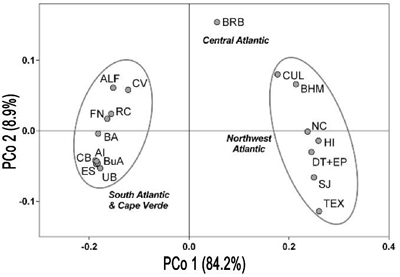 The SAMOVA (K = 3) and the PCoA separated foraging areas geographically, highlighting three groups: 1) all South American foraging grounds and Cape Verde, 2) Northwest Atlantic foraging grounds, and 3) Barbados (Fig. 3). Using this a priori grouping in the AMOVA, a highly significant structure was observed among the groups (FST = 0.7289, P < 0.001). Brazil; BuA, Buenos Aires, Argentina; CV: Cape Verde. The MSA using RMUs as potential sources estimated that 77.9% of the green turtles foraging at Culebra recruit from the Northwest Atlantic RMU (95% CI: 68.4-86.6%), 16.2% from the Central Atlantic RMU (95% CI: 8.4-25.2%) and 5.9% from the South and East Atlantic RMU (95% CI: 2.1-11.2%) (Fig. 4a). The MSA using individual nesting populations estimated that 34.9% of the Culebra turtles originated from Tortuguero, Costa Rica (95% CI: 1.4-58.3%); 29.2% from Mexico (95% CI: 5.8-61.8%); 13% from East Central Florida (95% CI: 0-60.7%); 12% from Suriname (95% CI: 0-24.2%), 3% from South Florida (95% CI: 0-20.1%), 3% from Cuba (95% CI: 0-21.8%) and 3.5 % from Guinea-Bissau (95% CI: 0-9.9%) (Fig. 4b, and Supplemental Table 2). Equatorial Guinea; STP: Sao Tome and Principe. Understanding the links between developmental habitats and the source populations of migratory species is critical to assess threats at their different life stages, and develop effective conservation policies. Here we analyzed the genetic composition of two important developmental aggregations for green turtles in the Caribbean (Culebra, Puerto Rico), over a period of seven years, and predicted the most likely connectivity of these aggregations to Atlantic nesting populations, using mtDNA control region sequences and a MSA, improving our understanding on the movements of green turtles in the North Atlantic. The similarity in the genetic composition of Tortuga Bay and Puerto Manglar suggests that there is no differential recruitment between the two foraging grounds, which was expected given that these are only 2 km apart. There was also no significant genetic differentiation between Culebra and the Bahamas. This foraging ground also has major contributions from Northwest Atlantic rookeries, but not from Central Atlantic rookeries (Putman & Naro-Maciel, 2013), contrary to what we estimated for Culebra. At greater distances however, there is structure among foraging grounds, and we found two major groups, represented by the northwest Atlantic and the south and east Atlantic. The Barbados mixed stock was distinct from both groups, as it receives equal contributions from both north and south Atlantic nesting populations (Luke et al., 2004), potentially due to its position relative to the coalescence of the North Equatorial and South Equatorial currents (Luke et al., 2004). The MSAs indicated that the Culebra aggregations originate from multiple rookeries within the Wider Caribbean region. This strong regional connectivity agrees with the 'closest to home' hypothesis, where immature turtles tend to move to and settle in foraging grounds closest to their natal beach after recruiting to neritic habitats (Bowen et al., 2004; Bolker et al., 2007). Similar patterns of regionalized recruitment have already been observed in Atlantic green turtles (Bass et al., 2006; Bolker et al., 2007; Naro-Maciel et al., 2012) and in other marine turtle species (Bowen & Karl, 2007). However, this pattern may be influenced by the geographic position of foraging areas and nesting beaches relative to major oceanic currents (Luke et al., 2004). The connectivity within the Wider Caribbean estimated in the MSA is supported by several tag returns from foraging and nesting adult turtles (Fig. 5). Most of these tags were recovered at Nicaragua (n = 8), at foraging grounds long known to be used by the nesting population of Tortuguero (i.e., Miskito Cays, Carr & Ogren, 1960; Bjorndal, 1980), but also at Venezuela (n = 1), Colombia (n = 1), and Florida (n = 1). In the latter, a turtle first tagged as a juvenile at Tortuga Bay in 1997, was found nesting in 2014 (Bagley, pers. comm. ), further confirming this connectivity. Interestingly, there was also a tag return in 2006 from the north of Brazil (State of Ceará, >3500 km, Lima et al., 2008), so more distant links can exist. Noronha, Brazil; and CUL: Culebra foraging aggregation (Map created using www.seaturtle.org/maptool). Throughout the seven years of this study we could not detect a significant variation on the frequency of the mtDNA haplotypes at the Culebra aggregation, which could suggest that there were no changes in the overall contributions from the major source populations (i.e., Costa Rica, Mexico, East Central Florida and Suriname). These results are not conclusive however, because our annual sample size may have been too small to detect significant change. We did observed a slight increase in the frequency of haplotype CM-A5, which could potentially be associated with the positive trend in population growth at rookeries where this is the dominant haplotype, i.e., Suriname and Aves Island (Garcia-Cruz et al., 2015; Turny, pers. comm.). At Puerto Manglar, a positive trend on abundance with a mean annual increase of 10.9% was observed over the course of 15 years (1998-2012, Patrício et al., 2014), more accentuated from 2006, owing to increased recruitment. This reflects the positive trend in the source populations (Chaloupka et al., 2008), which may lead to changes in the relative contributions from Atlantic rookeries to the Culebra aggregation, particularly if they are not all recover at the same pace. Both Tortuga Bay and Puerto Manglar foraging grounds are recruitment sites for post-pelagic individuals, where minimum sizes found are 22.8 and 29.8 cm SCL, respectively (Diez et al., 2010). A long-term capture-mark-recapture (CMR) program has revealed that immature turtles remain in these bays for several years (ca. 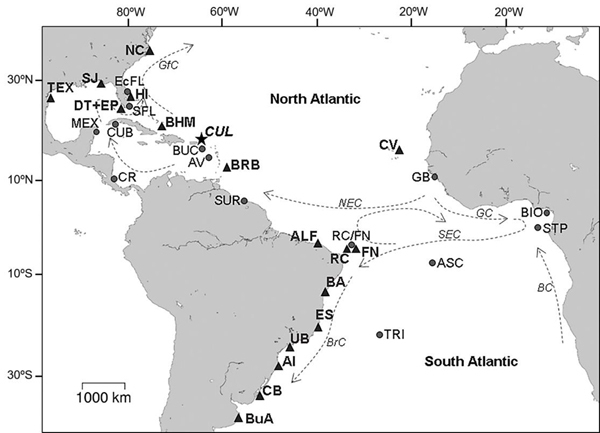 10 to 17 years, Patrício et al., 2014), and that larger immature turtles (>65 cm SCL) permanently emigrate, potentially to subadult foraging sites closer to their breeding grounds (Patrício et al., 2011). As turtles spend such a long period of their early life at these developmental sites, mortality there can impact the multiple rookeries to which they are linked. Juvenile green turtles at Culebra's aggregations have high survival probability (0.83; CI95% = 0.79-0.87, Patrício et al., 2011), comparable to estimates found for juvenile mixed stocks in areas virtually free of human impacts (Bjorndal et al., 2003; Chaloupka & Limpus, 2005). Occasional stranding's of immature green turtles with evidence of boat collisions or of fibropapilloma tumors have occurred; otherwise no direct hazards for green turtles are known at the study sites. Habitat degradation, however, may have a negative impact, as both coastal urban development and recreational boats continue to increase in the area. Fibropapillomatosis (FP) is endemic to Culebra's aggregations and in 2003 disease prevalence reached 75% at the most affected foraging site (i.e., Puerto Mangiar, Diez et al., 2010). It was shown, however, that FP did not affect survival rates (Patrício et al., 2011), and that individual recovery was likely (Patrício et al., 2016). Green turtles, once abundant in the Caribbean, faced major population decline of possibly 99%, since the arrival of European (Jackson, 1997). Thanks to conservation efforts of the past decades, major green turtle populations worldwide are now rapidly recovering (Chaloupka et al., 2008). This has been particularly noticeable in the wider Caribbean region, where long-term data allows for robust abundance trend estimates of major populations, e.g., Costa Rica, Florida, and Mexico (Seminoff et al., 2015). A positive abundance trend was also detected at Puerto Manglar, as mentioned earlier (Patrício et al., 2014). Turtles are however still harvested in some regions in the wider Caribbean (Humber et al., 2014). Most notably at Nicaragua there is a large legal artisanal fishery of green turtles aimed for local consumption (Humber et al., 2014; Lagueux et al., 2014), but additional commercialization of turtle meat continues to occur due to lack of law enforcement, and this fishery was estimated to take ca. 8000 turtles per year, and considered to be unsustainable (Lagueux et al., 2014). The majority of tag returns from the Culebra aggregation came from Nicaragua, which poses a conservation paradox if efforts are conducted to protect these juvenile aggregations but unsustainable harvesting at later stages of their life occurs elsewhere. Our study emphasizes, therefore, the widely recognized need for a comprehensive regional conservation strategy (Wallace et al., 2011). Samples analysed in this study were obtained with the help of numerous field assistants and volunteers. We also wish to thank two anonymous referees for their constructive commentaries. Research support was provided by the Department of Natural and Environmental Resources of Puerto Rico (DNER-PR), US National Marine Fisheries Service (NMFS-NOAA, Section 6, grant NA08NMF4720436), US Fish and Wildlife Service, Chelonia Inc, and WIDECAST. Work was conducted under permits by NMFS-NOAA (permit nos. 1253, 1518, 14949) and DNER (06-EPE-016). ARP had the support of the Portuguese Foundation for Science and Technology through the strategic project UID/MAR/04292/2013 granted to MARE, project IF/00502/2013/CP1186/CT0003 and the fellowship SFRH/BD/85017/2012). Bonfil, R., M. Meÿer, M.C. Scholl, R. Johnson, S. O'Brien, H. Oosthuizen, S. Swanson, D. Kotze & M. Paterson. 2005. Transoceanic migration, spatial dynamics, and population linkages of white sharks. Science, 310: 100-103. doi: 10.1126/science.1114898. number and deposited in Genbank. samples were combine in 'others' (n = 5). estimated with an analysis of molecular variance (AMOVA).